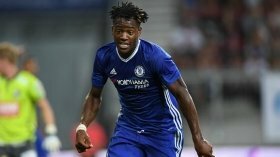 Valencia general director Mateu Alemany has confirmed that Michy Batshuayi is expected to seal his return to Chelsea after failing to meet the requirements at the Spanish club. The Belgium international joined the Spanish side on a season-long loan from the Blues in the summer after he was deemed surplus to requirements under Maurizio Sarri. However, his stint with the Mestalla outfit has been far from successful with just three goals in all competitions and Alemany has now confirmed that the club will seek to terminate his temporary deal. "Batshuayi's situation is very clear. I expect he will leave in the coming hours or days. The player knows he is leaving, we told him some weeks ago," he was quoted as saying by Marca. Still, Batshuayi is unlikely to reclaim a first-team position at Chelsea with Sarri at the helm and his return from Los Che may witness him being loaned out to another club with Crystal Palace among the main suitors.